The head of the Executive Committee of Almetyevsk, Tatarstan - Ayrat Khayrullin (left) and CEO of Copenhagenize Design Co. - Mikael Colville-Andersen (right) touring the city. The Russian city of Almetyevsk teams up with Copenhagenize Design Co. on a visionary urbanist project. A complete transformation into the best bicycle-friendly city in Russia. The desire for life-sized cities knows no borders. When the City of Almetyevsk, in Tatarstan, Russia, decided to embark on one of the greatest urbanist projects of the 21st century, they hired the renowned Danish consultancy and design bureau, Copenhagenize Design Company to tackle the job. Despite the current geo-political climate, international sanctions as well as cultural, linguistic and engineering differences, Almetyevsk - a city of 150,000 - is dead-set on transforming itself into the most bicycle-friendly city in Russia - and in record time. Copenhagenize Design Co. is tasked with developing a comprehensive strategy for the development of bicycle infrastructure in the city and coaching them until completion of the project. Over 200 km of Best Practice bicycle infrastructure is planned, along with all the necessary bells and whistles like bicycle traffic lights, pre-green for cyclists, extensive bicycle parking and general prioritizing of cyclists like you see in Copenhagen. Tatarstan is an independent republic in the Russian Federation, with their own President and a largely autonomous political existence. Russian colleagues look with envy to the Republic as it is more well-managed, it would seem, that Russia itself. There is impressive political will in Almetyevsk. The Head of the Executive Committee of Almetyevsk, Ayrat Khayrullin, is the driving force behind the city’s coming transformation. An energetic man in his early 30s, Mr Khayrullin is well-versed in what it takes to become a life-sized city. 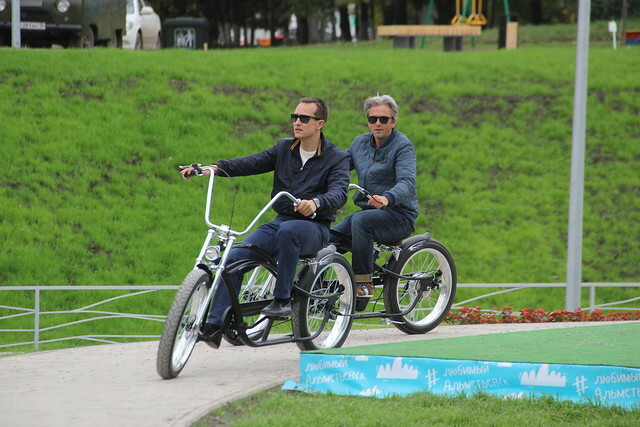 Mikael Colville-Andersen, CEO of Copenhagenize Design Co., was impressed on the company’s first visit to Almetyevsk. “We met a man of passion who had done his homework about what infrastructure is necessary and the societal benefits of cycling. For example, he knew well that bi-directional cycle tracks don’t belong on streets and that one-way cycle tracks on each side of the road were the way forward. It was brilliant to meet a politician who had done so much research”. Indeed, Mr Khayrullin has outlined his wishes in no uncertain terms. He wants two things; for his kid to be able to cycle safely anywhere in the city and for there to be more cyclists than motorists. 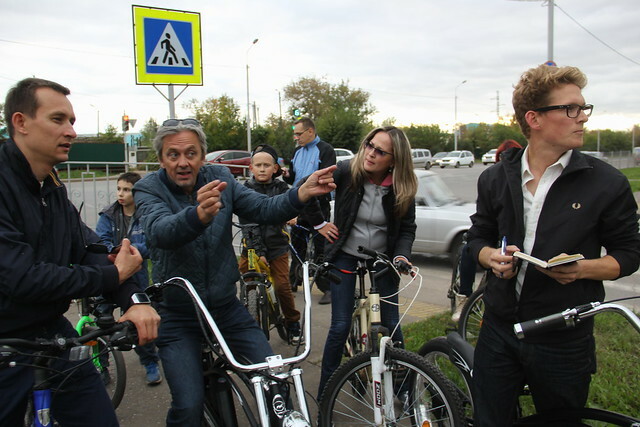 Copenhagenize Design Co. visited Almetyevsk in September 2015 for preliminary meetings and discussions with city officials and engineers in order to start planning the strategy. CEO Mikael Colville-Andersen (middle, above) and Urban Planner James Thoem (right, above) were given a comprehensive bicycle tour of the city by Mr Khayrullin (left, above) and his team. Mr Khayrullin is already working to better his city with the design of parks and facilities that would work perfectly in any city in the world. The Kazan design agency, Evolution, who is partnering with Copenhagenize Design Co. on this project, has also been involved in designing parks in the city for Mr Khayrullin. While there is no restriction to what city can implement bicycle infrastructure regarding typology of roads, Almetyevsk’s greatest advantage is that the city was founded in 1953 and the roads are more than wide enough to accommodate a solid network of Best Practice infrastructure. There are no baby steps in Almetyevsk - no single pilot project on one stretch of roadway - an entire network will be implemented from the first day. In the late 1940s, oil was discovered in the region and the cornerstone for Almetyevsk was laid at the heart of oilfields that contain 7% of Russia’s oil reserves. For someone like Mikael, who was born in Fort McMurray and who grew up in Calgary, driving to Almetyevsk from Kazan was like going back to childhood roots. It’s basically Albertastan, as he puts it.. The irony of designing Russia’s best bicycle-friendly city in the heart of the oil industry is lost on no one. 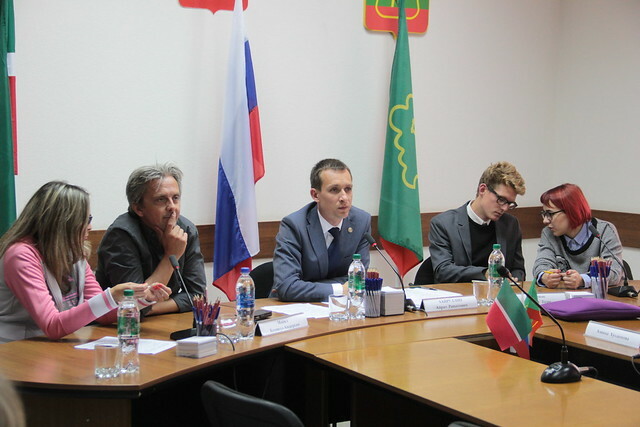 In addition, the national oil company in the Tatarstan Republic is financing the entire project. “When I coined the word ‘copenhagenize’ in 2007 I would never have thought that we would be working on doing it with an entire city, from scratch”, says Mikael Colville-Andersen. “This is the bicycle urbanism version of Niemeyer’s Brasilia or Griffin’s Canberra. Except it will actually be a positive urban development. We hope we make Le Corbusier roll a few times in his grave by the time we’re done”, he adds. Press conference in Almetyevsk. October 2015. Copenhagenize Design Co. was back in Almetyevsk in October 2015 for detailed meetings with the City and staff. Work on the development of the strategy will take place through the winter and work will begin in the spring. The backbone of the network - 50 km of Best Practice infrastructure on primary arteries - is scheduled for 2016, followed by secondary roads and residential neighbourhoods the following spring. In addition, a comprehensive intervention of road diets and traffic calming will be added to the project’s ‘to do’ list. All in order to lay the foundations for other urbanism developments that will establish Almetyevsk as a truly life-sized city. The capital of Tatarstan, Kazan, has recently placed some painted lanes in the city - not a comprehensive network, certainly not Best Practice infrastructure - mostly symbolism. Almetyevsk has the opportunity to show the way forward for the capital but also every other city in the Russian Federation. All the established theories and Best Practice about how to design a city for bicycles based on a century of experience will be put to the test in an oil town on the western steppes of Russia. Almetyevsk will be given all the available tools and coaching guidance to ensure their transformation. What they end up doing with it remains to be seen. At this stage, however, the future is bright and the will is strong. We're ready to work. In the 1950s, the city of Hannover was rebuilt in the car-centric style of the age and it was dubbed The Miracle of Hannover. Within a few years it is possible that we will be referring to The Miracle of Almetyevsk.